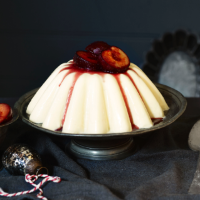 This set pud will keep for up to three days, so it’s ideal for getting ahead and making in advance. 1 Put the almonds in a mixing bowl. Gently heat the milk and cardamom pods in a saucepan until just boiling. Pour the hot milk over the almonds, then cover with cling film. Leave to cool and infuse for at least 4 hours, preferably overnight. 2 Strain through a sieve lined with muslin or a clean tea towel, set over a large measuring jug. Once it is mostly drained, gather the cloth and firmly squeeze all the remaining liquid out, leaving the dry almond meal behind (use in granola, muesli or porridge). Top up the liquid to 650ml with extra milk, if needed. 3 In a separate bowl, whisk the egg yolks and sugar together until pale and thick. Heat the almond milk in a saucepan until just below boiling point, then gradually pour over the whisked egg yolks and sugar, stirring constantly. Return the mixture to the pan and cook, stirring often, over a very low heat until it thickens slightly; don’t let it boil. Meanwhile, soak the gelatine leaves in cold water for 5 minutes. 4 Squeeze the excess water out of the gelatine and stir into the almond mixture until completely dissolved. Strain through a sieve into a clean bowl, then sit this inside a second, larger bowl filled with iced water. Stir until the mixture cools and begins to thicken. 5 In a separate bowl, lightly whip the double cream to soft peaks. Using a balloon whisk, whisk this into the cooled almond milk until incorporated. Pour into a 900ml (2 lb) jelly mould (or use individual moulds) and chill for at least 4 hours, or overnight, until set. 6 Preheat the oven to 200˚C, gas mark 6. Lay the plums, cut-side up, in a baking dish. Mix the honey, vanilla pod and seeds (or paste) and ginger. Drizzle over the plums and roast for 15-20 minutes, until soft and caramelised, but holding their shape. Remove the plums; add 2 tbsp hot water to the dish, stirring to form a sauce, if needed. 7 Dip the outside of the jelly mould into a bowl of very hot water for a few seconds. Turn out onto a plate, giving it a firm tap before removing the mould. Serve with the plums and juices.